Enjoy the top 1 famous quotes, sayings and quotations by Andrea Barham. At school, my religious-education teacher expressly forbade us to write "Xmas." It was regarded as a foul blasphemy. How would I like it if people used an anonymous X in place of my name? However, it would seem that the word "Xmas" is not blasphemous after all. In the original Greek, "Christ" was written "Xristos," but the X isn't the Roman "ecks"; The Cassell Dictionary of Word Histories explains that it is the Greek letter "chi" (pronounced with a k to rhyme with "eye"--k'eye). 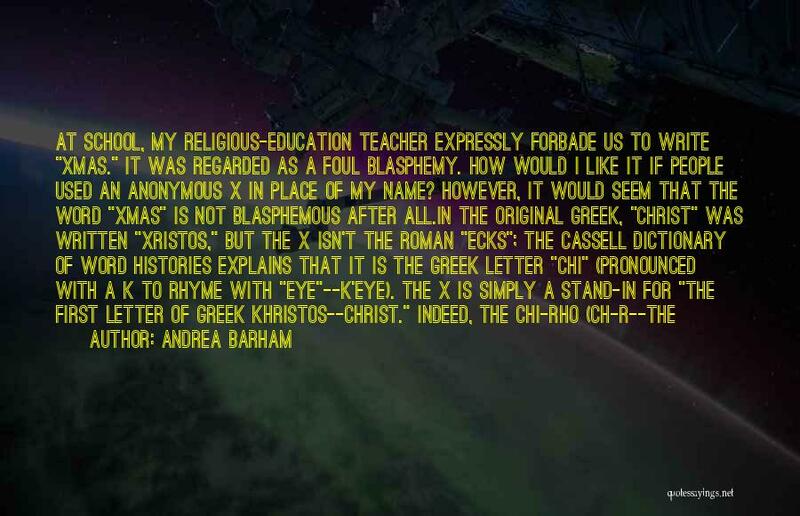 The x is simply a stand-in for "the first letter of Greek Khristos--Christ." Indeed, the Chi-Rho (CH-r--the first two syllables of "Christ") illumination can be seen in the ancient Irish manuscript of the Gospels, The Book of Kells, which is housed at Trinity College in Dublin. This work dates back to the ninth century. And now we're supposed to go back to our normal lives. That's what people do. They have these amazing experiences with another person, and then they just go home and clean the bathroom or whatever."